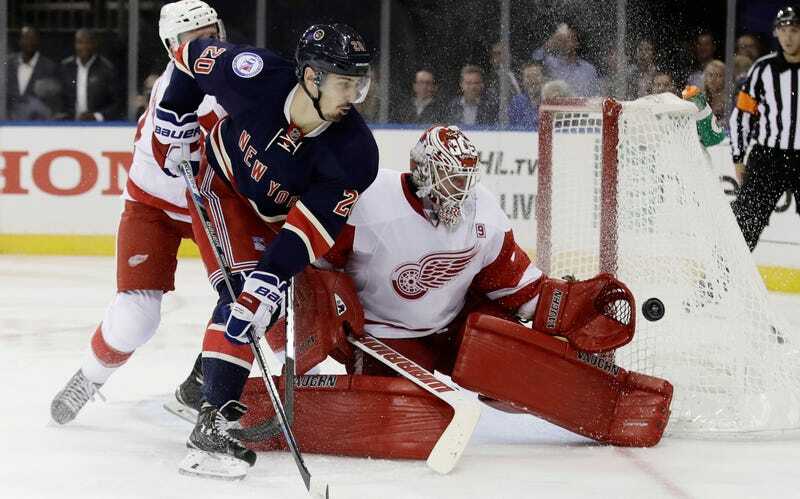 If you were stuck in one of those obstructed-view seats at MSG last night and couldn’t see either net, it probably looked to you like the Rangers dominated the Red Wings. Well I hate to be the one to break this to you (honestly I’m surprised you didn’t find out before now, or even pick up on the myriad non-visual cues) but Jimmy Howard stood on his head. Howard, making his first start of the season, made 32 saves, many of them spectacular and way too many of them coming against breakaways and off turnovers, and bailed out Detroit for a 2-1 win. “Jimmy stole the game,” coach Jeff Blashill said. “Honestly, that’s one of the better performances I’ve seen from a goalie, really at any level. Here’s a highlight reel of Howard’s excellent night, but pay particular attention to the sequence at 0:42, three tremendous saves on Ryan McDonagh, Derek Stepan, and Jimmy Vesey in succession. Howard is in a position he’s never faced in his long Red Wings career: clear backup. This is, for the first time, unambiguously Petr Mrazek’s team. (Last season was a mess, with Howard winning, then again losing the starting gig, then looking like he might be traded over the summer. But the three years and $15.9 million left on his contract make him a tough sell.) It’s an adjustment for sure, but Howard says he’s figuring it out. Just to be clear, there’s no goalie controversy here. Blashill made a statement when he let go goaltending coach Jim Bedard after 18 seasons, and hired Jeff Salajko, who mentored Mrazek in the AHL. Barring injury, Howard is hoping only to excel in limited action, and perhaps to convince a desperate team to trade for him. It’s a tough life, that of the veteran starter-turned-backup. Starts like this one have the potential to make things more interesting.